I had some difficulty with this opinion of רב יהודה when it appeared in ברכות. See my comments there. Interestingly, there it is רבי אבא and here it is רבי זירא. It seems רב יהודה had a group of תלמידים, each with the same fear of him due to his opinion on עליה and each with the sam thought - to hear one more teaching from him before leaving. And, of course, each got his own teaching. As I've mentioned previously, it's always fun when דף יומי intersects with other items on the calendar. Sometimes the פרשת השבוע will come up. Every now and then דף יומי and משנה יומית intersect. Yesterday, we discussed whether a תחש was בהמה or a חיה. And today, משנה יומית covers נזיר ה:ז which discusses a נזירות on the condition of whether or not a כוי is a חיה or בהמה. Neat! In this סוגיא, we are introduced to two groups of זריזים. However, there is an interesting disparity between them and in the way רש"י interprets them. The בני החבורה are not inherently זריזים. After all, all of בני ישראל would have been part of one חבורה or another. That would make everyone זריזים. Rather, they are זריזים of the moment. The task at hand - preparing the קרבן פסח - renders them זריזים. Clearly, the כהנים are different. They are always זריזים by nature. Interestingly, when רש"י explains the זריזות of the בני החבורה it is one of dependency. That is to say that we are relying on others in the group to correct another who might attempt to stoke the coals. According to ר' יוסי in פסחים ח:ז a קרבן פסח may be shechted for a single person. According to רש"י's understanding here, it would seem that a single person cooking his own קרבן פסח would not be subject to this exemption. But the כהנים, as רש"י explains, are independently זריזים and thus, even a lone כהן would be subject to the exemption. As I saw in the Artscroll - according to the רא"ש, the reason why קשקושי ואברורי are not a problem is because they do not serve a functional purpose i.e., they are not inhabited. It would therefore stand to reason that the roofs of present-day houses, which are often sloped and therefore cannot be used for any purpose, need not be lower than the shul. I believe there is some requirement in Muslim villages that no building be higher than their house of prayer and that is partly the purpose of the minaret. If this is true, it is quite ironic that this גמרא is immediately followed by a passage discussing working for an Ismaelite. Looking forward to מסכת שבת. So even if one were to go to his חברותא’s home to learn, his own home would remain devoid of תורה learning. Fortunately, in our time, the telephone has allowed us to accomplish a both of these. Please see this recently written shtikle on Koheles referencing this גמרא. The מהרש”א addresses how בר קפרא lesson is no superfluous in light of the משנה. Without actually answering any questions, I wish to simply draw attention to an interesting discrepancy between the two. The משנה is in fact often misquoted with the short form במקום שאין איש. The משנה actually uses the plural – אנשים. In a place where there are no men, you should strive to be a man. Here, however, בר קפרא only instructs הוי גבר where there is not a single man. I’m not quite sure what to make of this distinction. This phrase should be somewhat familiar. We had it back on .נ"ט and yet again on :נ"ט. What is most intriguing, however, is that each time the suggestion to resolve a dispute on the wording of a ברכה by including both opinions, it is made by רב פפא. This seems to be a unique trait of רב פפא. There is some discussion in the ספרי אגדה as to what exact נס transpired here. רש"י in ויצא, whose source is פרקי דר' אליעזר, seems to imply that the fetus was simply switched from a male to a female, as our גמרא would seem to indicate. However, תרגום (המיוחס ל)יונתן בן עוזיאל, explains that דינה and יוסף switched wombs. The parsha begins with a description of the life that Yosef lead and the relationship he had with his brothers. Rashi (37:2) comments on the words "vehu na'ar," that Yosef had some tendencies like those of na'aros, young girls. He would comb is hair and beautify himself. R' Yaakov Kaminetzky, in Emes l'Yaakov takes this one step one further. He writes that this is also why we find female-like tendencies in Yosef. This suggestion troubled me greatly. First, Rashi does not seem to hold like Targum Yonasan*. According to Rashi, Yosef really had nothing to do with the whole Dena episode. And even according to Targum Yonasan, there is no switching of gender at all but rather the fetuses switched wombs. Even Radal's suggestion does not fit with Targum Yonasan, let alone R' Yaakov's. *Incidentally, רש"י's approach is problematic with his commentary to פרשת וישב מ"ו:ט"ו where he explains the attribution of the boys to their mothers and daughter to her father with our later גמרא of 'איש מזריע תחילה וכו. The מהרש"א answers the difficulty in רש"י with the תרגום יונתן. This גמרא has already popped up earlier on דף כ. (Make sure to see the related shtikle there.) In that גמרא, it was ר’ יוחנן speaking as to why עין הרע did not apply to him. At the time, I simply understood that he somehow knew he descended from יוסף. But in this גמרא, we are giving general counsel to anyone wishing to be saved from עין הרע. So I’m not understanding how any Jew can lay claim to being from the progeny of יוסף. Isn't this ironic? Today's דף discusses אספרגוס. Yesterday's משנה יומית, the end of נדרים פרק ו also discusses אספרגוס! I find this to be a common misconception among the masses. When two people have eaten bread and trying to join up with another for a מזומן people seem concerned as to whether or not the other has had a מזונות. It is clear from here and the הלכה that a מזונות is not needed. As long as the third (or for 10 - 3 out of the 10) has eaten or drunk anything requiring a ברכה אחרונה other than water, they may combine. So if in the חומש we find that סיגלי is Jasmine, how come in the גמרא we find that סמלק is Jasmine and סיגלי is something else? שערי אהרן on פרשת ויצא mentions this question as well without an answer. רמב"ן apparently has a separate issue with רש"י in that the :גמרא שבת נ discusses יסמין. So we see that it is something in the גמרא's lexicon. So why would a different word in the גמרא be a reference to יסמין? It seems altogether probable that this is the same רב יהודה mentioned on :כ"ד who held that it was forbidden to go up from בבל to ארץ ישראל. We see clearly that his strong stance against עליה is not necessarily in contrast to a genuine love of ארץ ישראל. On the contrary, not only did רב יהודה genuinely love ארץ ישראל his love was greater than any other's and actually influenced his position on the נוסח of ברכות. From here we derive that once one washes מים אחרונים, he should not eat anything further before ברכת המזון. [The language would definitely seem to imply, on the surface, like it is referring to נטילת ידים before eating and the גליון הש"ס points out that we find in other places that is the actual intent but it clearly is not here.] The משנה ברורה קע"ט:א is quite strict on this matter and adds that even talking or any other form of הפסק should be avoided, based on the specific language of the גמרא as תכף obviously implies immediacy. Indeed, you do find individuals who are careful in this matter. However, ערוך השלחן in קפ"א:א very strongly disagrees and asserts that speaking is not a הפסק of any concern in this situation. Something doesn’t quite add up here. ר’ יוחנן holds that the חצר is already קובע for מעשר. So according to him, this “trick” of the דורות האחרונים wouldn’t even work. That’s all fine. But isn’t this the same ר’ יוחנן quoting רבי יהודה בר’ אלעאי contrasting the two in the first place? Why would he quote this position if it does not concur with his own halachic position? UPDATE: The note in the Artscroll mentions this point and points out that when this piece appears in other locations, the words "דרך חצרות" are not included, which would solve the problem. However, the צל"ח apparently keeps the גרסא as is and has an explanation but I have not seen that yet. The פשט understanding of this passage is simple: השם owns the land and all the food within it. Recognizing this and reciting a ברכה allows us to take ownership and partake of that food. However, R’ Yaakov Moshe Kulefsky, זצ”ל, would often say a beautiful דרוש in the name of the אפיקי יהודה. You may learn this passage vice versa. Before we make a ברכה, food is a mundane object with nothing but this-worldly attributes. It is on a human level. When we make a ברכה on our food, we elevate to a higher level – a Godly level. So indeed after the ברכה it is לה’ הארץ ומלואה! This קל וחומר bothered me for quite some time. How does the logic actually work? Wouldn’t you be more thankful after being given something than you would before receiving it? I found an answer to this quandary in the most unlikely of sources – a Jerry Seinfeld comedy routine. He was going on about how difficult it is to pay the bill at a restaurant at the end of your meal, when you are full and satiated since you no longer appreciate how much you wanted the food. And I realized that this was indeed quite a profound observation. If you go to a fast food restaurant and pay for your food up front, somehow, it’s not as difficult. You’re really hungry. You really want that burger. You’re staring straight at it. So you can easily part with the money to obtain it. But when you’re finished eating and fully satisfied, the food is out of sight and you no longer appreciate how much you needed and wanted that food and thus, paying for it becomes more difficult. Likewise, with ברכות, it is not as easy to appreciate how indebted we are to השם for providing us with sustenance when we are satiated. But still we are commanded to do so. How much more so, when we are hungry and in need, we should certainly more easily come to the recognition that HaShem provides us with all and express that by means of a ברכה. As רש”י explains, the משנה lists the exception where the ברכה is changed due to a certain level of importance. Indeed wheat is elevated to המוציא when in the form of bread. But it can also be elevated to a בורא מיני מזונות when in a processed form. Why is there no mention of that in the משנה as here would seem to be the proper place for it. Upon further inspection, it doesn’t seem בורא מיני מזונות is mentioned anywhere in the משנה at all! Why would that be? So an eighth of an eighth of haughtiness is good, at least for a תלמיד חכם. So why isn’t this included in the list of things that are nice in moderation? I think the answer lies in the גר”א’s insightful approach to the גמרא in סוטה. He asks why the גמרא chose that specific number. Doubling up the number has a certain poetic effect. But why not a seventh of a seventh, or a ninth of a ninth? The גר”א answers that an eighth of an eighth is 1/64, just less than 1/60. In other words, the גאווה should be בטל בשישים. So then you can’t even consider it a מעוט since it is בטל. So it does not qualify for this list. At first glance, this statement certainly seems to present a leniency when it comes to when מנחה and מעריב should be davened. Much has been written about how what can be done on a daily basis as well as leniencies that might exist for ערב שבת. However, the ערוך השלחן או"ח רל"ג:ז has and interesting take on it. He writes that the intent of the גמרא is not to give you a choice. Rather, ideally, one should account for both opinions by making sure to finish מנחה before פלג המנחה like רבי יהודה but then not to start מעריב until after שקיעה like the רבנן. Of course, that is very difficult to do, especially in the winter. Interesting little observation on this halachic tidbit. This seems to be a blanket statement which applies across the board to ראש חודש, חול המועד. שבת and יום טוב. When it comes to שבת or יום טוב, one might have suggested that since the structure of the תפילה has changed, the מנחה is no more תדיר than מוסף. That is to say, we say מנחה of שבת just as often as we say מוסף of שבת. Nevertheless, we see that is not the case. Despite the change in structure, we still judge the overall regularity of מנחה in whatever form it may take. I can’t think of any other case where this rule would be applicable. But I’m sure there’s one out there. This passage is actually teaching a separate הלכה which may or may not have been obvious - that a naked animal is not a problem of ערוה (although a pig is problematic due to the excrement that is always found on it as we have seen previously.) I don't think this is otherwise completely obvious. Although the root of the prohibition of ערוה seems to be attraction and distraction, one might have thought that the תורה prohibition of ולא יראה בך ערות דבר is absolute. In fact, it is, just that it seems from the way this גמרא plays out that the nakedness of animal is simply not called ערוה at all. I am adding a new tag to my list - מאאקמל - standing for מלתא אגב אורחיה קמשמע לן - to include points that are derived from the גמרא only by reading between the lines. "The ability to respond "I don't know" or "I am not sure" to questions and problems that life or individuals pose is the hallmark of true intellectual and human honesty. I am skeptical about people who know everything and always have an answer. The great Biblical and Talmudic commentator, Rabbi Shlomo Itzchaki (Rashi), often states in his works, "I do not know the meaning of this word or phrase." Well, if he doesn't know the meaning of the word or phrase why doesn't he just ignore it? Of what purpose is his stating that he doesn't know the correct meaning? I have always felt that his purpose in including in his commentary the admission that "I don't know. . . " is an enormous educational lesson for life and true scholarship. Otherwise, we, the students of his commentary, would have assumed that the word or phrase in the Bible or Talmud is so simple and self-understood that it requires no comment. Rashi alerts us to the fact that just the opposite is true. He is teaching us this is an obscure and difficult phrase or word and will require great effort on the part of the reader/student to interpret it. "I don't know" or "I am not at all sure of the answer" are the phrases that often are the most illuminating." Although R' Wein is referring to matters of word meaning and our example is that of a talmudic reference, I think the lesson applies just the same. Once again, in a not-so-obvious manner, the גמרא reveals a matter of priorities. Clearly, to recite קריאת שמע in the water and not come out and fully clothe is not ideal in the least bit. However, the גמרא's conclusion above seems to suggest that it is still preferable to recite it in this manner in order to do so כוותיקין. So the specific timing of קריאת שמע takes some degree of precedence over some laws pertaining to the ideal manner in which to recite it. I have a suspicion, however, that this would only apply to those who regularly daven כוותיקין as opposed to a casual occurrence. I couldn't find anything else more detailed on the topic. As is documented in a number of places, ר' יוחנן was quite a noticeably attractive individual. However, earlier on, at the beginning of the second י"ג:) פרק) we find that he was also quite a large man - not just overweight or even clinically obese - so large that it was too difficult for him to sit up to recite קריאת שמע when he was on his bed. Clearly, in the times of the גמרא these two attributes were not mutually exclusive. For a fascinating scientific approach to this גמרא, please check out this shtikle. On the topic of מת referring to living individuals “on their way to death,” see this old shtikle from פרשת בלק. I am proud to announce the unveiling of the latest addition to the Weekly Shtikle blog network. This one will be slightly more challenging to keep up with since it requires my following of Daf Yomi (so far, so good.) Also, I will need to post in a timely manner while readers still have the relevant daf in mind. Let me explain the name. I wanted to come up with something original. The first ideas that popped into my mind - On the Daf, Daf Thoughts, etc - just didn't fit the bill. The name is inspired by a speech I heard at the Toronto Siyum HaShas by R' Yair Adler where he pointed out that a daf of gemara is sometimes referred to as an עלה, a leaf. This was as he was introducing the guest speaker at the event, Rabbi Moshe Tuvia Lieff (his pun, not mine. I promise.) 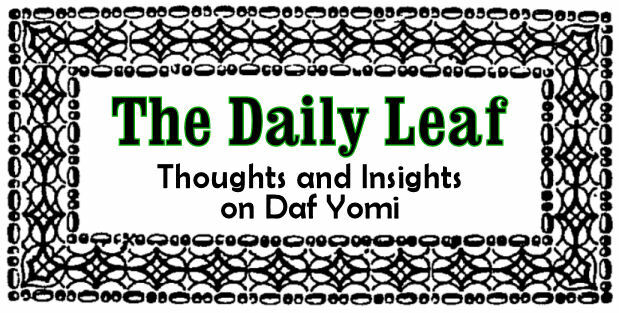 So, there you have it - "The Daily Leaf." It is intriguing to me that the logic employed throughout this דף seems to be directly contrary to that which used at the beginning of the פרק. When רבי declares that שמע must be read as it is written, in לשון הקודש, based on the word והיו, (and the רבנן hold to the contrary based on the word שמע) the assumption made by the גמרא is that if this is רבי’s opinion here because of the specific wording of the פסוק, that must mean that he holds exactly the opposite in all other instances. In our גמרא we also find that ר’ יוסי bases his opinion on the word שמע which would seem to imply that it is exclusive to the realm of קריאת שמע. Nevertheless, the גמרא then proceeds to assume this opinion, that one requires to hear what they are saying is common to ר’ יוסי in all other realms. This seems to be the exact opposite logical flow is that on דף י”ג. There is so much more to that פרשה. And והיה contains the מצוה of תפילין which is also only applicable during the day. So in this matter, they seem equal to me. The (שולחן ערוך (או"ח נ"ט:ד states that one should not answer אמן to the ברכה right before שמע. This is based on a number of ראשונים as indicated in באר הגולה. The משנה ברורה explains that it is treated like a ברכת המצוה. It is therefore the practice of many to say the ברכה with the חזן in order to avoid requiring an אמן. This הלכה has bothered me for quite some time based on our משנה. The משנה lists all of the points which are considered בין הפרקים. There is nothing to indicate that there should be any difference between any of them. They seem to be perfectly equivalent. Why, then, would one be treated more seriously than the other? All the rules of permissible interruptions should apply after הבוחר בעמו ישראל באהבה just as they do after יוצר המאורות. What is the basis for this distinction? Another "פרשה Bonus" this week as the above פסוק appears in פרשת ראה. The גר"א explains the מחלוקת in our משנה. The word כל can have two different meanings, much like the English word "all." It can mean "all of," in other words, the totality of. Or, it can mean "each and every." The discussion here is which does it mean in this specific instance. ר אלעזר בן עזריה understands it to mean the totality. So כל ימי חייך therefore means that your day should be "completely covered" by זכירת יציאת מצרים - once in the day and once in the night. The חכמים however take כל to mean "each and every." So the פסוק is therefore teaching us that we must remember יציאת מצרים every single day - even in the time of משיח. Although it is not our practice to follow this opinion, it is worth drawing attention to תוספות ד"ה והלכתא in which it is stated that even if one of the more minor additions for the עשרת ימי תשובה are omitted, one must repeat שמונה עשרה for it is considered a deviation from מטבע שטבעו חכמים. The term המלך המשפט is somewhat anomalous. Typically, when there is an adjective identifying a definite noun, the prefix ה is put on the second word*. This is what is "bothering רש"י" and why he has to give other examples in תנ"ך where we find similar phrases to prove that it is a somewhat common anomaly. * Funny story: Our גבאי, when delivering the מי שברך following an עליה will, if asked, mention the בעל קורא. Last time I got an עליה I asked him to include the בעל הקריאה. That kind of caught him off guard and he said הבעל קורא instead. But now I have him saying הבעל קריאה. Close enough, I suppose. Thanks to Yeshiva World News, I just found out about a brand new site, Live Daf, based out of Toronto, which provides video and audio shiurim on the daf. The video feature is nice for those who feel their attention is kept better when the shiur is visual, even if it's just someone giving a shiur. But the true uniqueness of the site is its interactivity. You are able to submit questions on the daf and have them answered and there is a Question of the Day feature on each daf. I guess it's kind of the interactivity I hope to accomplish with this blog one day. But there's always room for more - להגדיל תורה ולהדירהּ! ברוריה seems to make a beautiful point here but the problem is that is not the actual meaning of the פסוק. The word חטאים is also used to refer to sinners using the same בנין as, for example a גַמָל, referring to a camel rider. I recall R' Moshe Eisemann mentioning once, "didn't ברוריא learn דקדוק in seminary?" He offered the following answer: Surely, ברוריא knew that the actual meaning of the פסוק is that the sinners themselves should pass away. But the point that ברוריא was making was that since the פסוק could conceivably be read differently to mean "the sins," you, רבי מאיר, since you are involved in the conflict and thus נוגע בדבר, you have a responsibility to err on the side of caution and understand the פסוק otherwise. It is a similar theme we find later on (:כ"ח) that there was no one who was capable of properly arranging the extra ברכה to combat the heretics. Only שמואל הקטן whom, as we know (אבות ד:י"ט) was the champion of בנפול אויבך אל תשמח, was capable of arranging the ברכה with the proper intent. The גר"א has an interesting approach to this גמרא which I once used to answer a question from my father in פרשת כי תשא. Read on. We've already had some גמרא's that address the concept of not making מצות or תפילה appear as a burden. Nevertheless, is one has difficulty fitting דף יומי into the schedule and is looking for the quickest online shiur, it appears the best option is the שיעורים provided by the Young Israel of Century City, CA given by Rav Yitzchak Etshalom. One slightly frustrating thing about the audio, however, is that although it seems these were designed for דף יומי the files are not divided exactly by דף. So listening to the day's דף will often entail listening to portions of two separate files. Thanks to my father-in-law for this tip. רבה expresses his fear of חבלי משיח for which he is assured that he will be spared since he was plenty involved in תורה וגמילות חסדים. Doesn't it seem like ר' יוחנן is selling ר' אליעזר a little short in our exchange? Would it not have been more comforting to ר' אליעזר to assure him that he should not worry for he has certainly devoted his life to לימוד התורה. Rather, he seems to say, "Don't worry that you didn't learn enough תורה. Even if you learned less than you should have - as long as your heart is the right place, it is okay." It's always nice when the דף יומי intersects with פרשת השבוע. See last year's Weekly Shtikle which is relevant to the above passage. So when the גמרא first suggests that the specialty of אשרי is the line-by-line אלף-בית, they suggest that תהלים קי"ט would be preferable since it has each letter 8 times (that would make מנחה quite a bit longer, wouldn't it.) It is clear that the גמרא is suggesting a better option. One would have to assume that the next step in the גמרא is also suggesting a better option. If so, what exactly is better about נותן לחם לכל בשר more so than פותח את ידיך? Not sure. There's something I do based on this גמרא if I arrive at a מנין for מנחה which is already davening שמונה עשרה and I am in the middle of אשרי. I know the הלכה is that one should commence שמונה עשרה immediately so as to accomplish some degree of תפלה בצבור (unless it will cause you to miss קדושה.) However, if I'm in the middle of אשרי, my thinking is - why am I saying this? If I stop before פותח את ידיך I have accomplished neither of the special attributes of אשרי mentioned above. So I try to at least make it to פותח את ידיך. I found this line quite troubling. It is clear from the פסוקים that משה was talking to פרעה. Why would רב אשי say והכי קאמר משה לישראל?? Am I missing something? This is a fitting answer from רבי זירא. On the previous עמוד we were questioning what exactly happened leading up to חצות. One answer from רב אושעיא was that he was up well before חצות. It was רבי זירא who suggested that דוד was learning and dozing off like a horse. It is only according to רבי זירא that דוד would need an alarm clock. According to רב אושעיא he was always fully awake already. רש"י comments on this: ונקביו לצד צפון כיון שהגיע חצות הלילה רוח צפונית מנשבת בו. I initially found this quite puzzling. רש"י seems to be describing a wind instrument which the harp clearly is not. However, a footnote in the Artscroll explained what רש"י was referring to, based on the שלטי הגבורים. The holes are the holes of the harp's soundboard. This actually changes how I had envisioned the harp facing. Without knowing much about how a harp is played, I would have thought the broad side of the harp would face North but that, in fact, is not the case. See more about how the sound of the harp is produced.